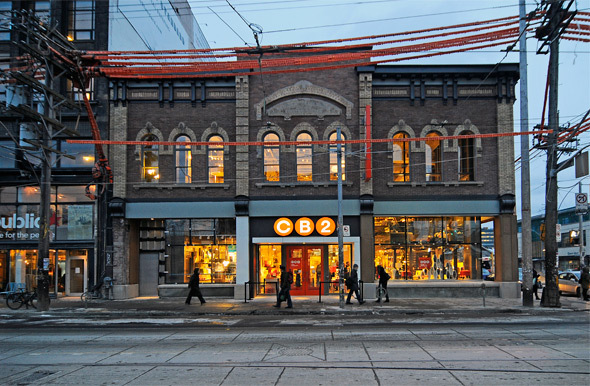 CB2 opened its first Canadian store this week in the frame of what was once the Big Bop on Queen West . There are hints here and there of the place that used to host teenage ravers and weekend GO Train riders, but for the most part, the transformation comes off as pretty drastic. Then again, I suppose any upgrade would look drastic when your starting point is of scuffed up stages and a throbbing purple exterior. The landlord, Daniel Rumack, was actually the one who took on most of the renovations, which included reinforcing the structure and replacing the floors on the second level. 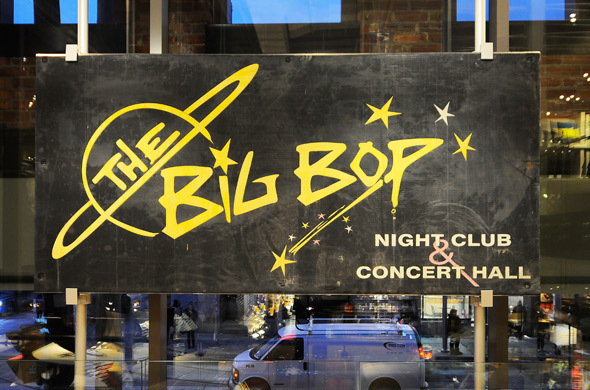 The building was first erected in 1876 as the Occidental Hall, later becoming the Holiday Tavern in 1948, and then endured several coats of purple paint in the 1990s in becoming one of Toronto's most-loved live music venues, the Big Bop. After about two years of renovations amounting to somewhere in the realm of $4 million, the tarp was removed last week to reveal an impressive external restoration. 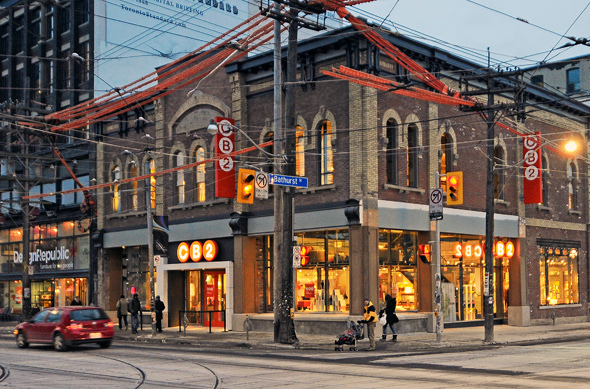 While the first floor brick walls had been replaced with that increasingly omnipresent Queen West glass, the second-floor seemed rescued and returned to its former pre-stucco/purple paint glory, with red and yellow exterior bricks framing gorgeous original arched windows. Once you step inside, however, the extent of the renovations becomes clear. Far from the dingy, gothic space it was when operated as the Kathedral, the new area is open, clean, and quite brightly lit, albeit, bearing the Bop's original floors. The stairs up to the second floor at the northwest corner of the space reveal the shop to be self-contained; that is, in certain areas you're essentially in a glass box, with a couple of feet of space between the walls of the box and the exterior of the structure. 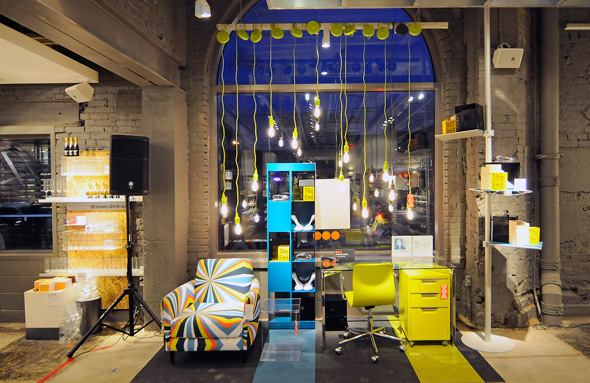 In that way, the shop has a bit of a lofty feel. 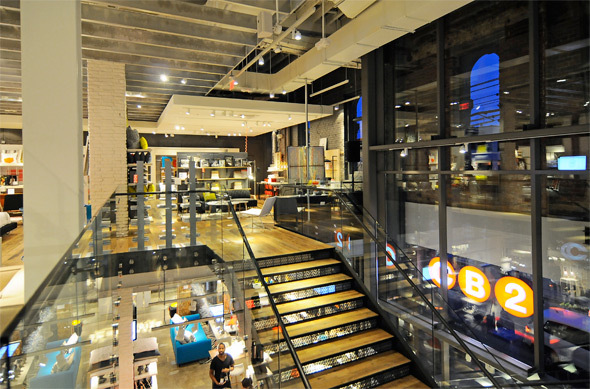 The landing between the first and second floor pays homage to the former tenant with the Big Bop's sign mounted above CB2's living room setting. The second level floor has been overhauled and redone, though there are still a couple original sliding doors and other touches that have been preserved through the reno. 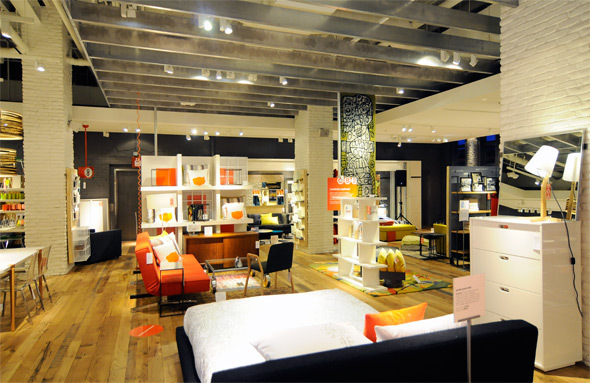 I spoke with Deidre Flynn, director of merchandising and operations at Crate & Barrel (CB2's parent company), who tells me the CB2 was actually looking at three different spots on the block when searching for a space for the store, including what is now the home of Joe Fresh at Queen and Portland. "It was the bones of this place," she says, referring to what finally had them sold. "It has really great bones, and we wanted to work with the space, work with the history to bring back the building." Vicky Lang, director of public relations at Crate & Barrel, pipes in: "What's the point of being in a historical building if you're not going to value the history that's already there?" As much as the landlord and new tenants tried to salute the building's past, there's only so much aura that can be maintained when an international modern furniture retailer replaces a venue where angsty suburban kids banged their heads for two decades. No matter how much of the frame you maintain, it still feels different. 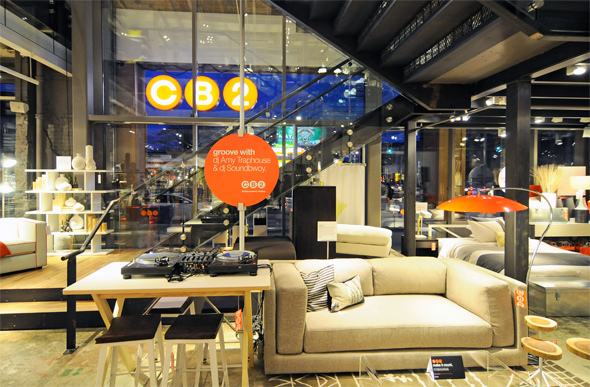 This is CB2's first Canadian store, with the second opening in about a month in downtown Vancouver. The look is modern — neutrals mixed with bright oranges, neon greens and reds — and the product line is what buyer Ryan Turf calls "affordable." 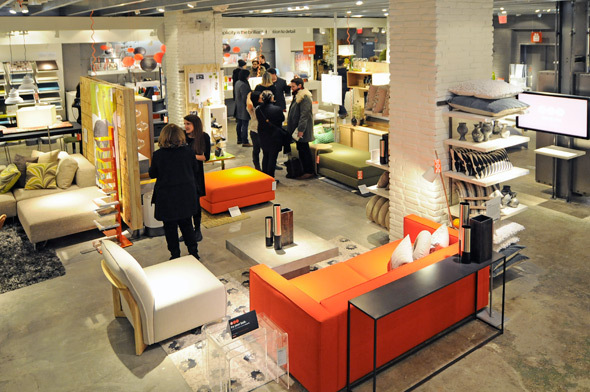 That's a relative term, of course, but it's clear that CB2 is aimed at younger folk who've yet to pad their savings accounts and stock portfolios. I spot a white oak seats-eight dining table with tapered steel legs for $1099, a sleek olive daybed for $999, and a great arc floor lamp for $229. 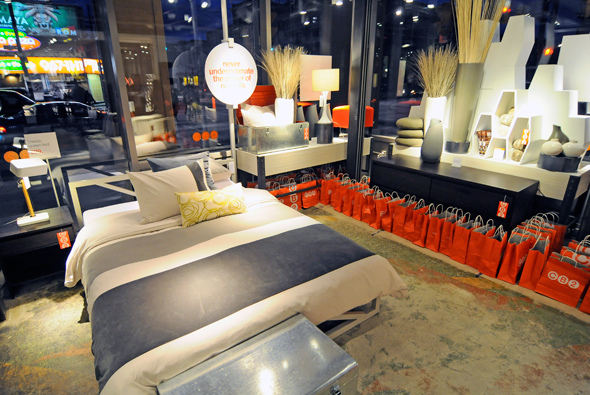 CB2 also has lots of little accessories and décor, such as a set of three frosted orange glass vases for $39 and a "dropped numbers" wall clock for $99.95. Almost everything displayed in store is also available online. I find evidence of the target demographic when checking out a set of three wall magazine racks ($49.95). 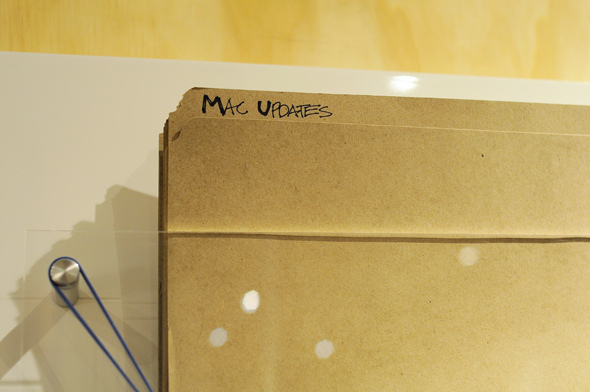 Ostensibly for display, each held a collection of paper file folders, one that was pen-inscribed with the label "Mac Updates," another with "OCD Articles," and the last with "Vegan Recipes." It's clear this isn't a space for metalheads or punk rockers anymore.